The PP56 prototype was developed in collaboration with PP Møbler and was put in production in 1989. PP56 deviates from PP66 in that it has an upholstered seat requiring a differently constructed frame. The upholstered version was designed to provide a softer sitting experience. In 1943 Wegner was asked for help by furniture producer Fritz Hansen, who had been importing and trying to fabricate light, moulded wooden furniture. Because of the war it had become difficult to import furniture, as well as the timber required for the company’s own furniture production. Since the prospect of peace was not imminent, Hansen’s workshop probably thought it necessary to protect its production by manufacturing a chair model similar to the internationally modern, mostly German-Austrian chairs. It would have to resemble these chairs visually and be based on the same industrial production methods, but still be Danish in terms of production, materials, and hopefully also appearance. However. For technical reasons the length of the steam bent sections they used on their own design, DAN-Chair no. 291, and planned to utilize as a basic element in the new model – would have to be shortened. Wegner tackled the job of making bent wood furniture for Fritz Hansen in surprising fashion. Instead of pursuing a new, modern idiom, he reached back in history and chose a classic Chinese chair as his starting point. He was possibly attracted by its beautifully slung top rail, whose length fulfilled Fritz Hansen’s demands, as well as the broad back that supported the rail and provided room to enjoy the structure of the wood. The seat was flat and hard with the underframe at right angles to the seat and legs. This combined with four short low stretchers made the chair look visually heavy. Wegner’s work took form, but the four different resulting China Chairs reveal a design process where it had been hard to find the right balance between tradition and modernism, equating his own demands regarding functionality, simplification and cabinetmaking skills and the task Fritz Hansen had commissioned. All four versions are equipped with the distinctive wide back, in keeping with their historical prototype, as well as a broad, square seat encircled by a sculptured, slightly declining top rail, that embraces the seated person. combination with the slightly conical legs lightened the visual impression significantly. At the same time this meant the chair had to retain a relatively heavy seat frame, especially where it met the legs. Both of these China Chairs were given a woven cane seat with a loose cushion. On the remaining two versions he kept the four stretchers, but replaced the loose cushion with a seat of woven papercord. On the last China Chair the seat was woven around the front and rear crossbarss which were shaped to improved sitting comfort in comparison with the straight frame of his penultimate China Chair. Even though Wegner’s China Chairs’ had a clear historical source and entailed more costly carpentry work, Fritz Hansen decided to proceed with two of them, the first, which was given product number FH4283, and the last, numbered FH1783 (today, PP66). FH4283, the lightest, most elegant and decorative of the China Chairs, was put into production in 1944 in cherry, while FH1783, whose appearance was heavier but more ‘Danish’ – thanks to its woven papercord seat and sturdiness – was put into production in 1945 using beech. Neither of the chairs’ first edition sold very well, and Fritz Hansen discontinued FH1783 in 1950. FH4283 remained. Although there was a break in production between 1960-63, it was not until the chair was re-introduced in 1963 that it became a perennial, iconic Wegner chair. Besides cherry, the chair was also produced in mahogany, and during this period could also be specially ordered in Brazilian rosewood or walnut. Today it is only produced in cherry or black-painted ash. FH4283’s leather-upholstered seat cushion gives it an exclusive appearance, which has helped make it a popular choice in corporate boardrooms and other ‘seats’ of power such as the Danish Parliament. PP Møbler re-launched FH1783 in 1977 with product number PP66. Like FH4283, it is available in cherry or black-painted ash, as well as natural ash and oak. The PP56 prototype was developed in collaboration with PP Møbler and was put in production in 1989. PP56 deviates from PP66 in that it has an upholstered seat requiring a differently constructed frame. Actually it was Carl Hansen & Son who first wanted to take over production of the ‘Danish’ China Chair back in 1950 when Fritz Hansen stopped trying to sell it. 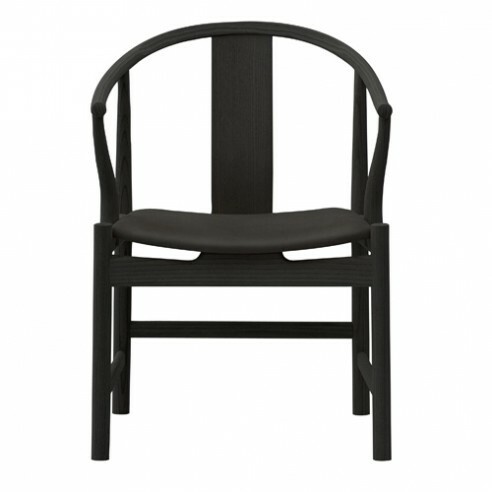 But Wegner preferred designing a new chair for Carl Hansen, whose company was on the island of Funen. This became the commercially successful Wishbone Chair. So the assignment that originally motivated Wegner to work with the China Chair motif, evolved as Wegner originally envisaged into a popular, light, modern and relatively inexpensive dining room chair with a steam bent top rail of Danish beech.